Sorry all, this show is canceled but we hope to reschedule soon! Gallery 263 brings Asaran Earth Trio, a NYC-based voice and percussion trio performing folk music from all over the world, to Cambridge! A collective of vocalists from different corners of the globe, Asaran Earth Trio is a group dedicated to singing beautiful music from around the world. 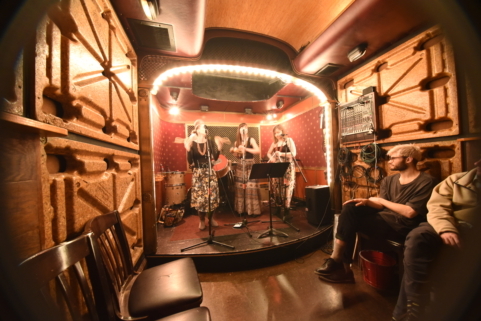 With New York City as their figurative ‘bar’, Asaran came together out of the desire to take different traditions in new directions, combining folk elements together with the adventure of group improvisation and each member’s musical ‘history’. Together they sing, clap, play percussion, and are known to cause groups of strangers to laugh, cry, sing, dance, and shake some groovy shakers. Asaran features Astrid Kuljanic from Croatia, Artemisz Polonyi from Hungary and Anne Boccato from Brazil. They love to share their music and stories all around the Earth – in living rooms, theaters, houses of worship, festivals, on the street, and even in actual bars.